I’m taking a couple months off work soon, to go traveling down under, which means I’ll need some money. Therefor I’m considering selling my wonderful orange Tonka-truck. If you live in Norway and feel the urge send me an email or leave a comment. 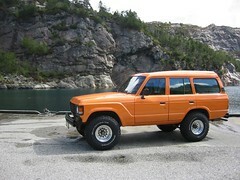 The car is a 1982 Toyota Landcruiser HJ60 in very good shape. I’ll get some more photos on my flickr over the weekend.